The LFB Challenge Round this season will be contested by the teams that finish between 5th and 8th place at the end of the Ligue Féminine de Basketball regular season. USO Mondeville who are currently fourth in the regular season standings have already assured themselves a place in the Challenge Round if they fail to hold on to 4th place. Nantes-Rezé came into this match sharing 6th place with four other teams with no guarantee of post season. Playing in front of the cameras of LFB-TV in the arena used by the men's handball team Nantes-Rezé just held off USO Mondeville (66-64). With this victory Nantes-Rezé are one game behind Mondeville but with just two games till the end of the season, they will need a lot of help from other teams to finish above Mondeville. Nantes-Rezé got off to the best start possible (12-5) with four minutes played. Lenae Williams was on fire going 4-of-4 from the field while scoring 9 points. Williams finished the first quarter with 13 points, just missing once as her side dominated the first quarter (22-12). Mondeville's early problems were due to the absence of K. B. Sharp and the 2 fouls picked up by Katerina Zohnova in the first minute of the game. 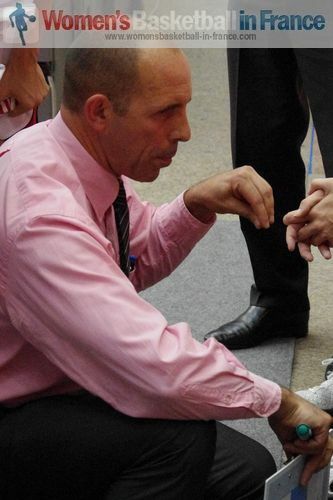 Hervé Coudray (in picture), the coach from Mondeville, changed his strategy in attack and defense during the second quarter and his team started to claw their way back into the game. They were back on level terms (32-32) with 90 seconds to play in the first half. Laurent Buffard reacted quickly and his team finished with a 6-0 run to go ahead into the locker room (38-32). The third quarter was a tactical battle with neither side getting the upper hand as they traded basket for basket. 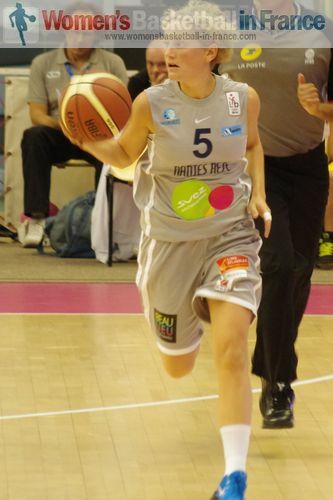 Nantes-Rezé maintained the 6-point advantage going into the final quarter (55-49). In the last quarter Williams (23 points) scored only 2 points while her team-mate Aurélie Bonnan (7 assists) - who by definition is a center - was showing her skills running plays with pin-point passing. Mondeville had no real pattern to their play. Laëtitia Kamba (14 points) and Naignouma Coulibaly (13 points) battled in the paint while Zohnova (11 points) took care of the mid-distance shots. With six minutes remaining Touty Gandega brought Mondeville back on level terms for the last time (57-57). A rainbow three-pointer by Caroline Aubert (right) put the hosts in front for good 30 seconds later. The game became rather untidy by both sides with a lot of turnovers and careless fouls. With one minute to play Johanne Gomis (14 points) was allowed an easy lay-up (66-61) that more or less secured the victory. Mondeville were fighting to save the 4-point advantage from their first meeting. They went 3-of-4 from the free-throw line. A last careless turnover presented Mondeville with the chance to force overtime or win the game. However for reasons best known to Ingrid Tanqueray, her intended pass ended up flying out of the court.